Oh it's all under President Trump. 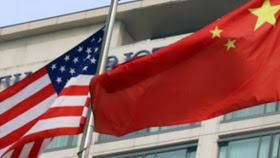 US duties on Chinese products of $ 34 billion (25.7 billion pounds sterling) came into effect, marking the start of a trade war between the two largest economies in the world. The 25% tax came into effect at midnight Washington time. China responded by imposing a similar tariff of 25% on 545 US products, worth a total of 34 billion dollars. Beijing has accused the United States of triggering the "biggest trade war in economic history". "After the United States activated its tariff measures against China, China's measures against the United States came into effect immediately," said Lu Kang, a spokesman for the Foreign Ministry. Two companies in Shanghai told the BBC that customs authorities were delaying clearance procedures for US imports on Friday. US tariffs are the result of President Donald Trump's attempt to protect American jobs and stop "unjust transfers of US technology and intellectual property to China." The White House has announced that it will negotiate additional tariffs for $ 16 billion worth of products, which Trump has suggested will come into effect later this month.